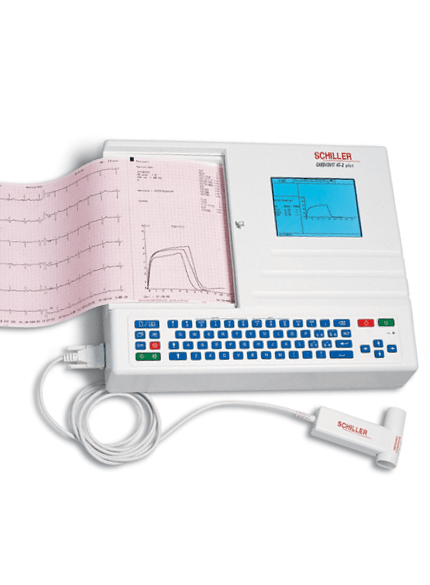 SCHILLER was the first manufacturer to combine the two most common pulmonary function and cardiac tests in one device - the CARDIOVIT AT-2 plus with ECG and spirometry function. No need to repeat ECG recordings since the quality of the waveforms is optimized by the SCHILLER smoothing and baseline filters. Save time and paper by simply monitoring all 12 leads on the integrated 3 channel screen. Inspiratory and expiratory pulmonary function tests: FVC, SVC, MV, MVV as well as pre/post medication tests. Visual support due to real-time graphics and display of the measured values on the screen.